Sandwiched in history somewhere between "Who Shot JR" and the original Live Aid concert, is a time when the British finally discovered garlic. Twenty plus years down the line I am finding it difficult to grasp the concept that I lived the first dozen or more years of my life without any help at all from the stinking rose. Imagine many meals based on bland minced beef, with little more than a hastily chopped onion added to impart extra flavour. I even thought I didn't like onions when I was little, so imagine further and you will see a haphazard collection of glassy little allium strings patterning the rim of my plate, destined only for consumption by the rubbish bin. Talking of waste, I am trying to address my problem of buying too much food for our needs and letting it rot in my fridge or dry out on my shelves. A case in hand is, perhaps, my favourite of the Acme loaves, the Pain Epi which brings much pleasure to Fred and me when we gourge on it somewhere around brunchtime on a Saturday. Although I buy it freshly baked, and often still warm at the market, once 24 hours and a lazy Sunday morning have rolled around, the remaining little epi ears of dough that survived our furiously hungry onslaught the day before have hardened to a state of far less appeal. So yesterday morning, thinking that nothing could be done with it, I threw out the last 3 pieces of that epi loaf. In my mind, a while later, I was replaying the previous evening's meal at Garcon, where a classically-inspired yet modern-looking appetizer of buttery garlic-drenched snails on toasted brioche had wakened a dormant memory. I suddenly started lusting for some good, old-fashioned garlic bread. 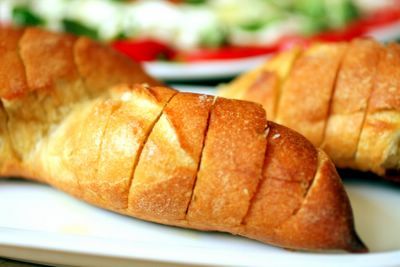 During the 1980s, when I was a teenager taking my first steps in the direction of adulthood by throwing little dinner parties with my girlfriends, until the time I left home to attend college and fend for myself, garlic bread was nearly always on the menu. As a nation, once we had discovered garlic, we couldn't get enough of it. It was almost more fashionable than Duran Duran. Once the idea was in my head on Sunday, nothing could stop me. I made sure Fred wasn't watching as I retrieved the loaf from the trash, minced some garlic and then whisked it together with softened butter and a decent pinch of salt. Wishing I'd also had some fresh parsley to add to the butter, I carefully made little slices into my bread and then filled each one with plenty of the garlic butter, wrapped it in foil and then popped it in the preheated oven at 350F for about 25 minutes. The butter oozed and melted into the softened dough and the crust started to crisp up as garlic aromas slowly started to permeate through the appartment, compelling us to hover in the kitchen, impatiently waiting for lunch. The moment for unwrapping the bread from its silvery cloak could not come soon enough. We risked burning the skin off the tips of our fingers to tear off chunks of the buttery, pungent bread and devour. Simple, brash, unrefined, messy and yet so lip-smackingly, satisfying. Had you forgotten about garlic bread? If so, it's time to remember again. 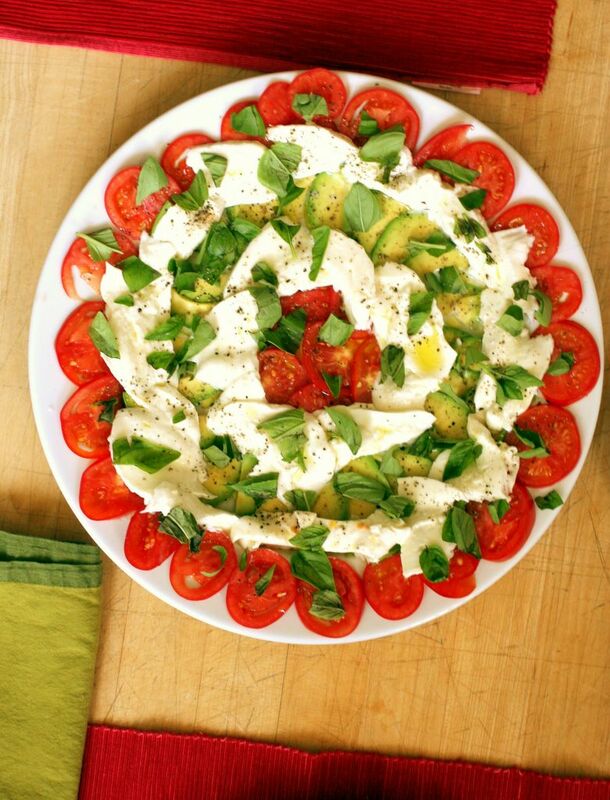 August would not be August without taking advantage of seasonal ingredients to make a salad of mozzarella, tomato, avocado and fresh basil. Don't forget to do that at least once this month too. Archive Alert! On this day in 2005: Eggs and Harry Potter. And at around this time in 2004: Plouf's new menu! i'm trying to reduce waste too but it's hard when so many recipes are waiting to be tried and eaten! i had a 1/2 loaf baguette hardening up so i threw it into the freezer. but your garlic bread idea sounds delicious. i think it's time to defrost! Ahh, garlic bread!! Food of the gods. I was born into a particular niche of the South where eating garlic is almost required, in order to survive around all the other people stinking of it. Growing up, one heard rumors that people are sometimes found dead in the gutters of New Orleans from garlic poisoning. :):) I swear there was a restaurant there that almost killed me with their garlic shrimp. 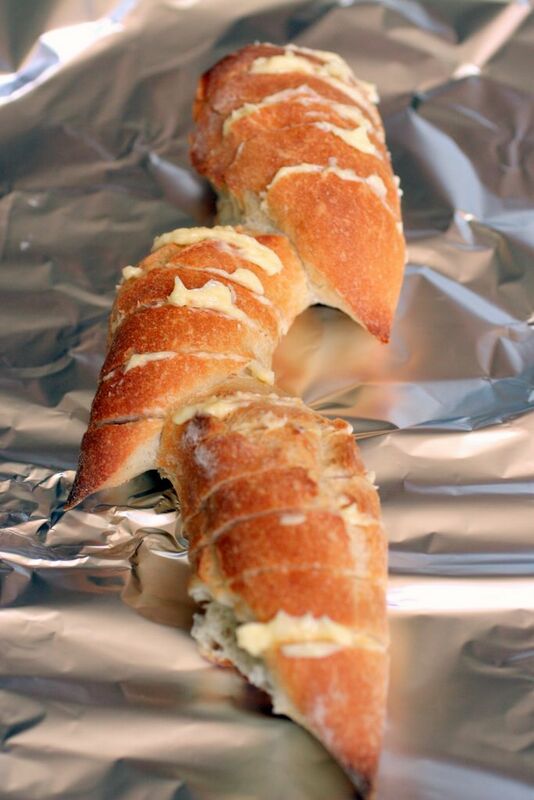 You've seen that Peter Kay gig, where takes about his Dad being horrified by garlic bread...genius. Oozing butter, oh yeaaaah. I love it when the bread is basically a sponge for the garlic and butter. Sam - maybe mainstream Britain. But I clearly remember the French Onion Sellers that used to cross the Channel in the 60s and 70s and then distribute briaded ropes of onions and garlic throughout the South of England - all by bike. We bought a couple of ropes of each every year. I also remember before supermarkets when we had a butcher and a baker and a chesse shop and a couple of greengrocers. I remember the rabbits and pheasants hanging in the window and the ropes of sausages. I wish I could go back and see it again. Unfortunately for the pre-teen me, the "new romantic" style wasn't exactly popular in North Carolina, and I was harrassed pretty bad. Still, after all these years, just hearing "hungry like the wolf" or "new religion" brings back so many happy 80s memories. Never heard of that, have to try it ! BTW, I love garlic bread too, but add lots of minced fresh herbes, like thyme, rosmary, summer savory, lavender or during winter months just a little Herbes de Provence. Wow, that is so beautiful Sam--both your written prose and those photos! That's a gorgeous salad! I never thought of adding avocado with fresh mozzarella - how decadent! wmm - i like that too, but I also like it without since that is what reminds me of my teenage years. yoony - absolutely. I think you can butter it before freezing then go straight from freezer to oven without the defrosting part? sher - maybe they were trying to fend off all those Anne Rice vampires? MonkeyG - no - where do I find it? Robyn - mm, garlic butter sponges,mmm. Owen - I have no doubt garlic was available for years before, of course,, but I think in the 80s with garlic bread becoming a widespread phenomena, I think that is when it found its place in the psyche of the entire nation. Chubby - thank you too much for the gift of the mentioned book. I am looking forward to checking it out. Kevin - I like The Reflex best. Ralph - yes I do - you should try it. It used to be common on the menus of Italian restaurants in London in the early 90s when I was a veggie and ordered it a lot. it was even called a "Tricolore" salad. There you go. I have no doubt is is not authentic, but I also have no doubt it is a winning combination. I love to add herbs to my garlic bread but since it wasnt really planned in shopping terms and since my herb garden on the deck is looking a bit dry and crispy I had no choice than to go without. catherine - do it, do it! ellie - I am hoping I dont forget this treat so soon the next time! I have been reading your blog for awhile. Excellent job! If you are too impatient to wait for the butter to soften you can cut it with a little olive oil. It also adds a nice flavor. Sadly, we don't have an Acme's here, which is probably a good thing since I developed an unhealthy daily dependance on their sourdough cheese rolls. Sainsbury's DOES have a pretty damn tasty bake-it-yourself garlic bread. Good call -- it's truly one of life's most perfect foods! I want it now. Right now. So tell me, how are you addressing the problem of buying too much food for your needs? I think I need help too. Got some garlic growing actually, for the first time. Planted on the shortest day (June) by moonlight (of course!) and will be harvested on the longest (december). Can't wait for the garlic bread cooked on the BBQ with that garlic! Garlic bread certainly was the height of sophistication, along with grapfruit cocktal as a starter (blech!). And even if it's now passe, there's very little to beat a cheesy garlic bread dripping with butter, especially at a BBQ. Mmmmm!